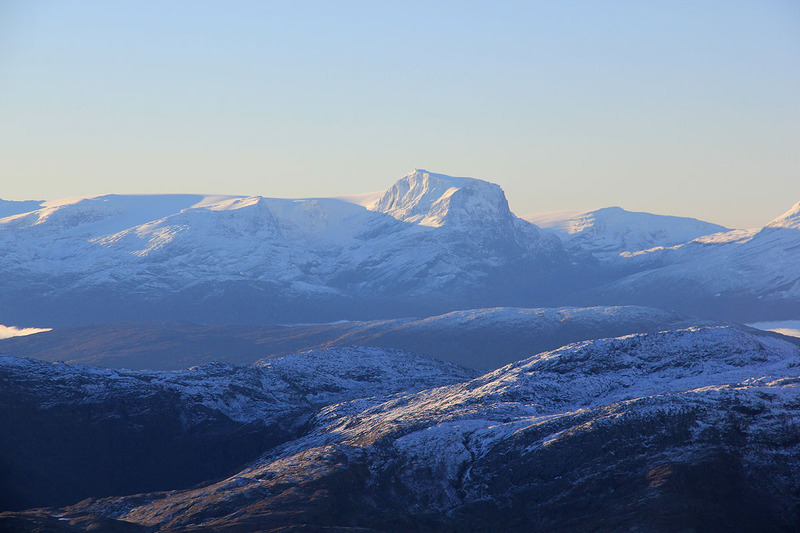 This mountain is located near the south end of Dalsfjorden on Sunnmøre. A good point of reference is the ferry directly across Voldafjorden from Volda (that is southwest of Volda.) This ferry used to be part of the main Hwy. E-39 from Volda to Nordfjordeid. (Still is in 2012.) Just as you leave the ferry area, a road signed Lauvikstad 43 km, goes right. Take this road and measure from here. 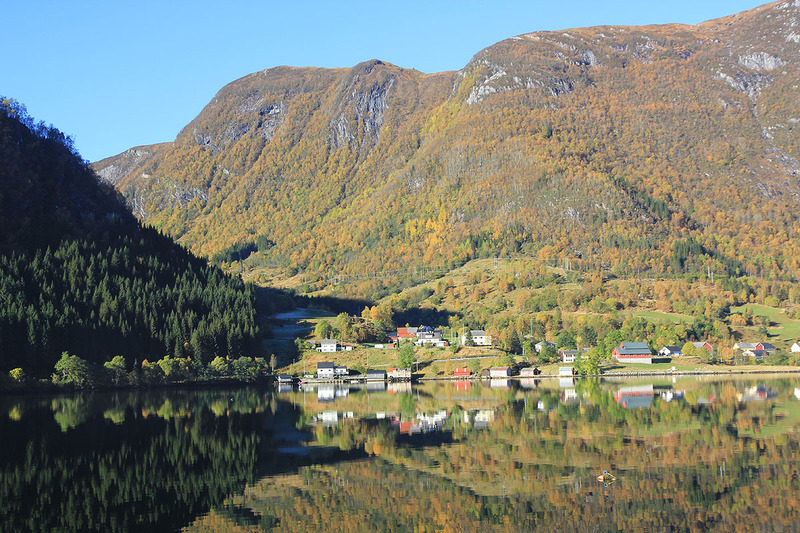 Drive 22.6 kilometer, you are now in Steinsvik at the end of the fjord. Continue a short distance to the next small community. 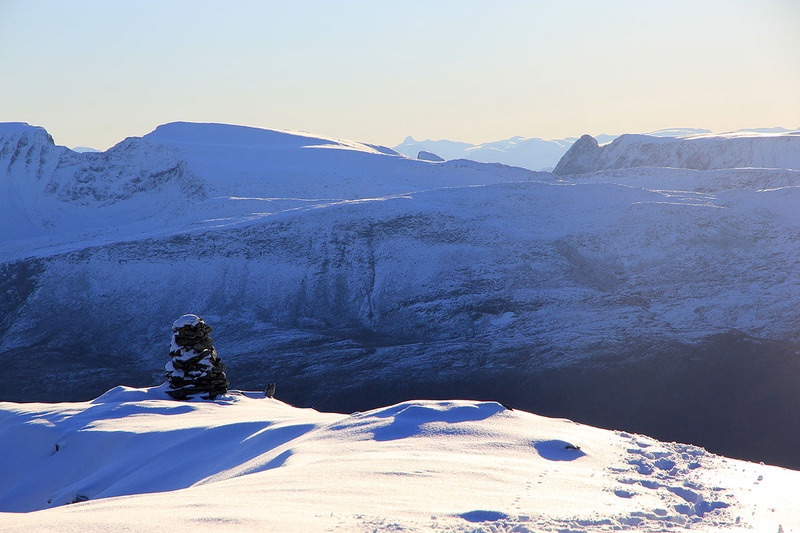 At kilometer 23.8, make a sharp left at a small road signed Åmelfotdalen. At kilometer 24.9, keep left. Then at kilometer 25.2, make a left onto a smaller road that will climb steeply out of the valley. This road is paved and may get extremely slippery if there is frost. After getting across a pass, at kilometer 29.6, go straight, then at kilometer 30.5 turn right onto the top of a dam. Continue until the road ends at kilometer 31.5. Park here, this location is N62.01391, E005.81216, elevation about 556m. From the trailhead, hike a bit up the trail leading to the cabins that can be seen higher up. This place is called Dansen on the map (the dance). 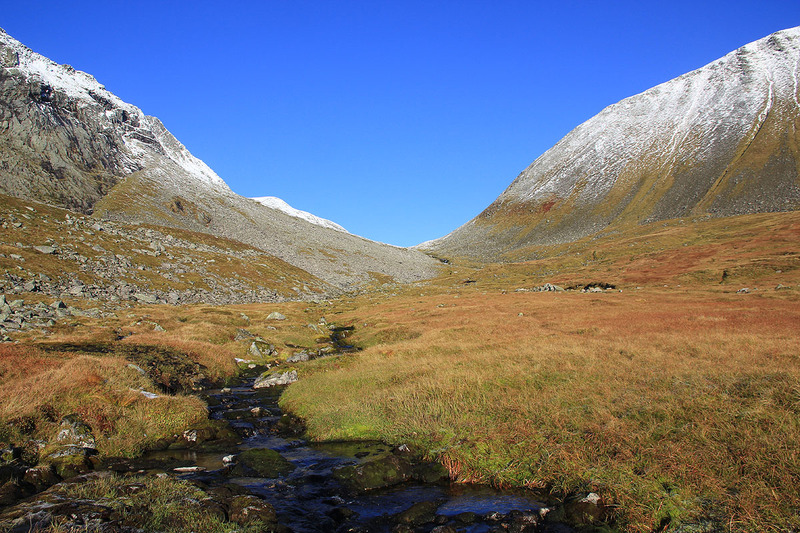 Cross the creek and turn left into the wide valley just south of the impressive Blæjeskardtinden, 1131 meter. The trail runs a bit up in the hillside on your left in the beginning, then slightly higher up, the trail crosses more over to the creek. This is just in front of a single, pretty distinct rock. Subsequently, the trail stays more or less parallel and to the left of the creek. Higher up, the terrain steepens a bit and there are a few boulders. 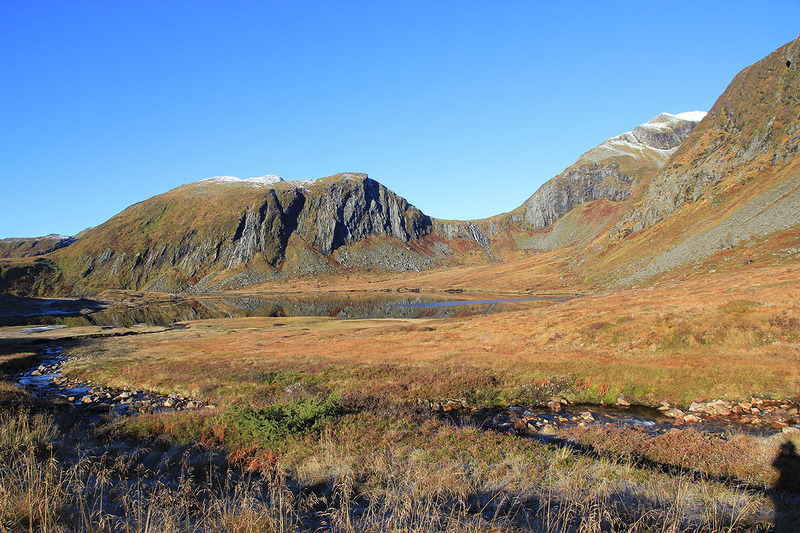 The trail runs on top of a pretty nice (small) moraine like ridge. From about 800 meter of elevation one should start a gradual ascending traverse left. As you reach slightly more gentle terrain, continue to climb gradually contouring up to elevation 1000 meter roughly at location N62.03139, E005.79042. From here, continue a gentle climb that will form an arc gradually going more right as the slope eases. 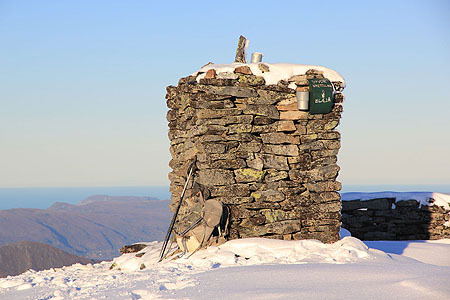 Continue on easy terrain to the very impressive summit cairn. I slept in the car at the trailhead, thus an early start at 0745. 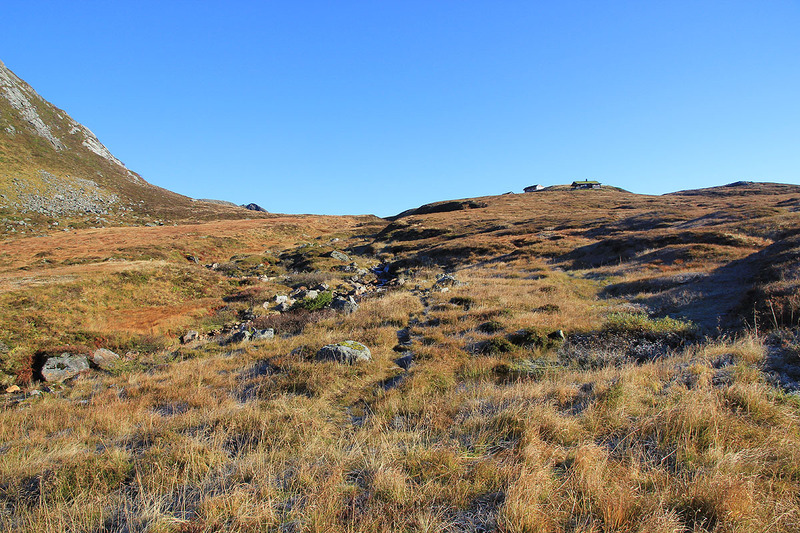 It was another perfect morning as I walked up towards the huts named Dansen on the map. I stayed left and entered the wide valley. A bit further along, I ran into a small trail and continued uphill along the creek. Snow started at the 850 meter level, and some quite recent footprints led the way. I summited at 0925 and signed the summit register. It turned out the the Maaseide family (5 people) had been here the day before me. Otherwise, not many visitors since early August. 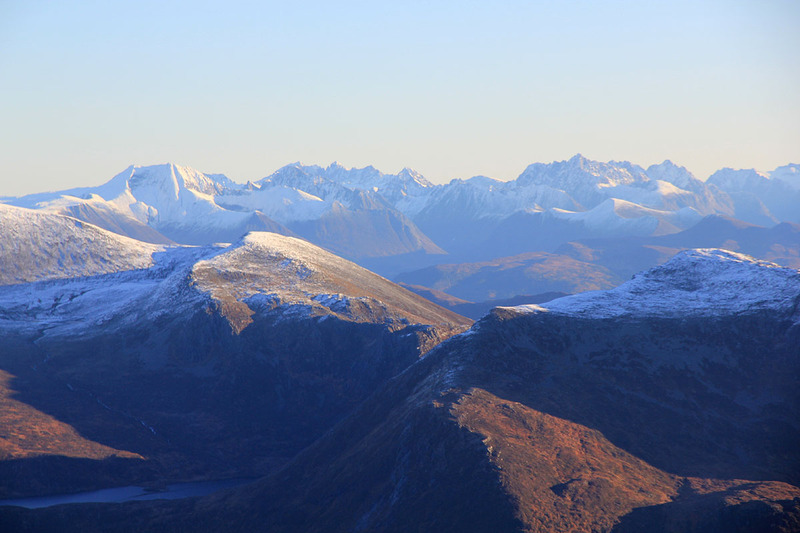 Great weather and scenery, Sunnmøre peaks further west, Lodalskåpa visible further southeast, then the always impressive Gjegnen south. The view was just superb and I stayed on the summit until 0945. Descending the same way, I was back at my car by 1050. The steep road from the valley floor to the trailhead had frozen during the night and not fully recovered. Fortunately, one long, steep grade was now in sunshine. Lower down, it was worse. I drove extremely slowly and carefully checked out the road by foot one section at a time.